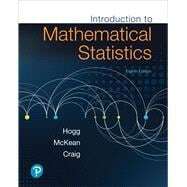 by Hogg, Robert V.; McKean, Joseph W.; Craig, Allen T.
For courses in mathematical statistics. Introduction to Mathematical Statistics by Hogg, McKean, and Craig enhances student comprehension and retention with numerous, illustrative examples and exercises. Classical statistical inference procedures in estimation and testing are explored extensively, and the text’s flexible organization makes it ideal for a range of mathematical statistics courses. Substantial changes to the 8th Edition — many based on user feedback — help students appreciate the connection between statistical theory and statistical practice, while other changes enhance the development and discussion of the statistical theory presented.